It is ironic that at a time when the world claims to be becoming a global village, distance abolished and various communities are growing to be more understanding and tolerant of one another, Sikhs should be having to launch protests against a French ban on turbans in government-run schools. The ill-considered ban should have never been imposed in the first place. Why should it take 20 years to catch him? UTTAR PRADESH police has every reason to be elated over the success in arresting Brijesh Singh. Public memory being proverbially short, few outside the state would have remembered his exploits when on Thursday the police went to town with the news of his arrest. The Indian Cricket League was launched a few months ago and it broke a barrier and the BCCI’s monopoly of cricket in India. The Indian Premier League (IPL) is BCCI’s response to ICL’s challenge. With celebrities from the corporate and movie worlds “buying” cricket teams for BCCI’s IPL, big money, mega-marketing, television and cricket, have come together to set the stage for a new era in the game. Many will argue over which was the greater triumph of New Year, Ratan Tata’s unveiling of the much awaited Nano that certainly grabbed world attention or the Indian cricket victory at Perth. The latter will surely go down in cricket legend but perhaps the Nano will impact more lives and more profoundly. In the early 1950s I used to be a regular at the children’s programme of All India Radio, Jalandhar. Whatever fee I was paid I would spend in buying the Classics Illustrated series that narrated great works of fiction in a “comics” format. Through them I read Dickens, Hugo, Dumas, Stevenson, the Bronte sisters, Poe, Tolstoy, Shakespeare, Quixote, and the like. OUR history will be what we make it. If we go on as we are, history will take revenge. Fear has got hold of us and we have compromised with the harshest laws and blatant human rights violations. Our focus on security concerns actually generates repression. Terrorism has made us cast our society in such a mould that we justify the excesses of state police or central forces. We are giving up too much. This week I would like to deal with two specific queries raised by readers on their rights as users of Automated Teller Machines (ATMs). In the first case, the consumer says that even as he was trying to withdraw Rs 9,000, there was a power breakdown and the ATM did not dispense the currency. However, the transaction slip showed withdrawal of Rs 9,000 from his account. Fatima Bhutto, the eldest of the surviving Bhuttos, on a visit to India these days, hates to be known as a symbol of the most popular political family in Pakistan. She is right in saying that dynastic politics should be discouraged as “nothing good comes out of it”. But the most sought-after young journalist and writer cannot deny the fact that she is in the limelight mainly because she is a Bhutto. It is ironic that at a time when the world claims to be becoming a global village, distance abolished and various communities are growing to be more understanding and tolerant of one another, Sikhs should be having to launch protests against a French ban on turbans in government-run schools. The ill-considered ban should have never been imposed in the first place. The 2004 ban does not stop at schools alone. The French government has also not been issuing passports, driving licences and residency cards to Sikhs who refuse to remove their turbans for ID photos. What is significant is that the turban has been worn by Sikhs with pride for centuries as a symbol of identity they believe in and belong to. Some do not; but that does not diminish its significance in any way. In fact, it only shows that it is not purely a religious accoutrement like the cross. That is all the more reason to allow its use in every secular society. French President Nicolas Sarkozy must be explained its significance during his Indian visit. That as eminent a person as Dr Manmohan Singh wears a turban regularly is an irrefutable argument in favour of a lifting of the French ban. As we wrote in an earlier editorial, will the French government like to exclude the Indian Prime Minister from dialogue just because he is a turban-wearing Sikh? Imposing the ban on school children and others is tantamount to discrimination. The Indian government ought to intervene in an effective manner and ensure that France lifts the ban which is simply ridiculous in the modern day world and against the tenets France has been standing for. The avowed purpose of separating the Church and the State will not be served by this odd ban because it clearly violates Article 18 of the Universal Declaration of Human Rights which maintains that everyone has the right to freedom of thought, conscience and religion, and to manifest his religion or belief in teaching, worship and observance. France needs to set an example in respecting human rights and not curbing these. UTTAR PRADESH police has every reason to be elated over the success in arresting Brijesh Singh. Public memory being proverbially short, few outside the state would have remembered his exploits when on Thursday the police went to town with the news of his arrest. It is this failure that precisely helped the criminal to lead a life of luxury in distant Bhubaneshwar. The details of the cases pending against Brijesh Singh, who hails from eastern UP, are bloodcurdling. There is hardly any kind of heinous crime that he has not committed. Like many of the dacoits of Chambal ravines like Man Singh and Putli Bhai, he began his career in crime avenging an injustice done to him nearly two decades ago. Having tasted blood, he continued his reign of terror without any let or hindrance. In two decades of crime he did not even spare the police. Worse, he even threatened political leaders like Chief Minister Mayawati. In fact, Brijesh Singh had become a byword for murder, loot, vendetta and plunder. All the while the police had been increasing the reward for his arrest, which finally stood at a staggering Rs 5 lakh. When he found it difficult to carry on his operations in UP, he shifted his base — goodness knows how many times — to Bhubaneshwar. What is amazing is that the police did not have a clue about his whereabouts despite the high-profile life he led. When the police finally arrested him, he was travelling in style in a SUV. Twenty years is too long a period for the police to arrest a criminal like Brijesh Singh, who did not live in a safe haven like that of LTTE chief Prabhakaran and mafia don Dawood Ibrahim. Nobody can claim that the police did not have either men or resources to catch the fugitive. He could surely have been caught and brought to justice long ago if the police and the political leadership really wanted it to happen. It is no surprise that Brijesh Singh, too, had his political benefactors to protect him. That, unfortunately, is the problem — collusion between criminals and politicians in Uttar Pradesh and some other states. So much for the way the country is being governed. The Indian Cricket League was launched a few months ago and it broke a barrier and the BCCI’s monopoly of cricket in India. The Indian Premier League (IPL) is BCCI’s response to ICL’s challenge. With celebrities from the corporate and movie worlds “buying” cricket teams for BCCI’s IPL, big money, mega-marketing, television and cricket, have come together to set the stage for a new era in the game. What has ushered in this revolution of sorts, of course, is the success of the latest version of the game – the made-for-excitement Twenty20, where the “boring bits” have been taken out, and batsmen set and chase targets at frenetic pace. While all sport has an element of mass entertainment about it, cricket always stood apart in claiming a certain affinity with the measured pace of life itself. Until the advent of one-day cricket, even high levels of athleticism were not necessarily called for. And while Test cricket does retain its charm — witness the following that the current tour to Australia has had – Twenty20 is a welcome new variant. The super short version of the game has now opened up new avenues for marketing, as there are more takers for every game. As organisers and sponsors discovered to their delight, more people were watching T-20 fixtures, including those featuring other countries. The idea was to “watch a good game,” and spend an evening being entertained, irrespective of who was playing. This explains why the moneybags are interested, and the rival Indian Cricket League, which got there first, spurred BCCI into launching the IPL. The BCCI also upped pay and perks for its domestic cricketers, a development that can only add to the talent pool. Just look at what a little competition has done for BCCI’s authoritarian ways! Their stand banning ICL players was ill-advised. The BCCI should remember that along with the right to field the national team, in effect sporting the national colours, also comes a responsibility — to find, hone and deploy the best, wherever they may come from. If they can do that, along with more entertainment, fans can also look forward to better players and more winning cricket. The national team should be selected from the best of the cricketers, irrespective of the banner they are playing under. If the Maruti 800 transformed the automobile scene in India, bringing a whole new segment of would be motorists on to the road, the Nano is likely to repeat this phenomenon on a bigger scale in view of the very much larger upwardly mobile cohorts evident today, especially in small towns and in the countryside. Pride and hope lie in the fact that the Nano is not merely the cheapest car in the world, admittedly without any frills, but is indigenously designed and produced. Further, in this day and age of crowded cities and global warming it could revolutionise how more people live and move around just as the Fiat bug and Volkswagen beetle did a half century ago. Critics have said that the Nano will add to congestion and pollution and could endanger safety. It will add exponentially to the number of vehicles on the road, along with other small care competitors. But it has Bharat III emission standards, with a boast of causing less pollution than many existing two-wheelers and the promise of high fuel efficiency at 23 km per litre. A small, light car is always exposed to danger on India’s highly unsafe roads; but it was Ratan Tata’s dream that there should be a safer and more appropriate ride than the perilous journey young family foursomes currently undertake on a scooter today. The two-wheeler will not fade away but the Nano is likely to be a transitional option and a liberating choice for millions. The answer to congestion and pollution in a larger and more pertinent sense is that it is for the state to improve and expand road networks in towns and countrywide, mandating parking facilities as part of city planning. More importantly, it needs to increase and improve public transport such as buses, tramways, and mass transit systems like the metro. More efficient and cheaper connectivity will alter the way people live, decongesting cities and dispersing living and working spaces into suburbia and smaller towns in combination with the satellite, computer, internet, cell phones and the other amazing transformations in communications. Low-energy mass transportation systems could gain an added edge were the present level and range of open and hidden subsidies on electricity and petroleum products as well as on water and other public goods to be reduced if not altogether eliminated. These subsidise the rich at the cost of the poor and encourage avoidable waste, extravagance, congestion and pollution. Despite oil prices pushing towards $100 per barrel the government, cultivating populist electoral politics, has been in no hurry to revise fuel prices upwards, with the Left, as always, huffing and puffing in the name of the poor who ultimately pay the price. Sundry protestors demonstrated in Singur while the Nano was being unveiled at Delhi’s auto show. These misguided folk are still being instigated to demand more jobs and better compensation for their acquired lands, thus impeding the very process that will in due course ensure them far better prospects. The Nano should be on the road by autumn and will generate some jobs at the Tata plant but far more, directly and indirectly, in ancillary industries and related services across the country. There will be a huge multiplier effect that critics are prone to ignore. With training, local youth will find increasing avenues of employment and expansion of the local market will open up new off-farm and agricultural opportunities making it a win-win situation for all. Why prevent or postpone that day? Nandigram will surely rue the day it was misled into scuttling its future. The same is happening in Orissa and elsewhere where mines, steel plants and other large investments are being thwarted. In some cases, it is clear that greed for ever more compensation for land is becoming an obstacle to rational choice. Landowners and other stakeholders are certainly deserving of a fair and even generous deal. But wholly exorbitant demands can only delay or deny project fruition to nobody’s benefit. If well done, with good planning and forethought, the incoming tide can indeed lift all boats. What Nano proves is that India too can dream and innovate. Innovation and entrepreneurship must be encouraged within well defined social and environmental parameters so that sustainability is ensured. More billionaires with a sense and, indeed, an obligation to show individual and corporate social responsibility may not be a bad thing provided that this is not only accompanied by but outpaced by an improved quality of life at the base. Widening disparities matter far more when deprivation rules high. One would have thought that my mother would be pleased. She was not. She did not like my reading these abridged versions. “If you read these you will never read the originals and miss out on some things truly beautiful,” she would say. Fifty years on, I now realise how right she was. Throughout my active working life I never got down to reading these masters of story-telling. It was only while rushing to the station a few years ago to catch a train to Chandigarh that I happened to grab one of the textbooks on my daughter’s English honours’ bookshelf to tide over the tedium of the journey. This was Jonathan Swift’s Gulliver’s Travels. It was an eye-opener. After that I have read several originals. Not only did I savour the beauty of their prose and thought, but also learnt that many of the stories did not quite start or end the way the illustrated versions of my early years did. For example, my childhood version of Dickens’ A Tale of Two Cities did not commence with one of the most memorable opening sentences of English fiction. And Les Miserables and Hunchback of Notre Dame did not end the way they did in my comics. To the race of intelligent horses, the Houynhnms, who have, by adhering to high moral standards, banished legal disputes, Gulliver can only give this description of lawyers: “There is a society of men among us, bred up from their youth in the art of providing words multiplied for the purpose, that white is black, and black is white, according as they are paid. If my neighbour hath a mind to my cow, he hires a lawyer to prove that he ought to have my cow from me.” In such a situation, says the traveller, he would be at a disadvantage, because lawyers being trained to defend untruth, his attorney would be unable to present the case for justice. A wide spectrum of human society comes under the attack of Swift’s biting satire. For a fairy tale, Gulliver’s Travels packs quite a punch. The way in which the Hindu Shiv Saniks or the Shiv Sena men are attacking the media to stop it from reporting the truth shows the authoritarian society they want to establish. It did not surprise me that the NDTV office was destroyed and its journalists were injured in Gujarat for announcing that M.F. Hussain, the famous painter, is the viewers’ choice for the Bharat Ratna. The police did not take any notice of the destruction. It took them one hour to reach the NDTV office, which is only 15 minutes away from the thana. The same type of religious zealots threatened the Godrej family at Pune. Muslims were asked not to buy Godrej-made goods. All this protest was because the Godrej family had hosted Salman Rushdie at their house in Mumbai. Whoever these custodians of Islam may be, they are only doing Islam great harm. Thank god, the Lt. Governor of Delhi withdrew the order which made it compulsory for every resident of the Capital to carry a photo identity card. This, as the order said, was meant “to ensure that terrorists or anti-social elements don’t sneak into the city.” Such elements, the government should know, do not want an identity card anyway because they know how to fudge papers. Had the order been implemented, it would have meant harassment to lakhs of people, particularly those from Bihar, who do not possess any paper to prove that they are residents of Delhi. They have been here for years, doing odd jobs. More than the order itself, it is the authoritarian thinking behind it that is worrisome. After all, it was the Congress government which had imposed Emergency (1975-77) to suspend even fundamental rights. The order’s withdrawal does not come as a relief. The central government, which directly rules Delhi, has something up its sleeve to restrict the individual’s liberty and free movement that the Constitution has guaranteed. In many states, the repressive POTA has come back in one form or the other, thanks to the BJP demand to bring back the draconian law. The centre, which included POTA’s dictatorial portions in the Unlawful Activities Act, is using it with a vengeance. As the shadows of intolerance lengthen, the state discards even simple values. Terrified citizens have nothing except to say that the government knows best. No society can prevent all threats. Some element of risk will always be there. We should take normal precautions but should never make such intrusive rules that they actually undermine democratic principles. Democratic nations slip into dictatorships when the citizens are not vigilant. Without the awareness of what is right and a desire to act according to what is right, there may be no realisation of what is wrong. In fact, the manner in which liberty is being flouted is worrisome. The University Grants Commission wants to prescribe a “homogeneous curriculum” in all Indian universities. This will take out even the last drop of creativity and independent thinking. Finally, the report to find out the reasons for the furor over the “obscene painting” at the Baroda University is out. The three-member committee has recommended the reinstatement of acting Dean Shivraj Pannikar, who had defended the painter, his student, against the attack by pro-Hindutva students. Yet, the committee appears to be afraid to come out openly on the side of the painter. It says that the painting would have been “obscene” if it had been displayed in public but since it was shown within the university premises, it was not so. What an apologetic approach? But then, the university is under Gujarat of Narendra Modi fame. Hussain is forced to live abroad because the hooligans who call themselves “the people” are after him. The government is too timid to intervene since the BJP is involved. Agreed, nobody has any right to hurt the sentiments of the other but they should not be stretched to a point where the fundamental right to freedom of speech and expression is restricted. The same is the case, more or less, with Taslima Nasreen, the Bangladeshi author living in India. It looks as if Taslima has been penalised for her liberal views. The extremists have made so much noise that the government has restricted her to a house. India’s traditions do not tally with the treatment meted out to her. Even the few visitors and friends allowed to meet her are harassed by the authorities. I only hope that her visa ending next month is renewed for a permanent stay. But then, the way in which she had been sequestered suggests that the government is looking only for a short-term solution. When it comes to basic rights, the Naxalites are the worst sufferers. An unequal society does drive people to desperation. Still, I abhor violence and favour a democratic solution to the problem. But it looks as if the government does not want Naxalites to return to democratic ways. One case is that of Dr Binayak Sen, PUCL vice-president from Chattisgarh. Presuming he is a Naxalite, there should be no bar if he wishes to pursue democratic methods to deal with his case. He wants to get a bail for the crime of “carrying a letter” from one set of Naxalites to another. Even that is not yet established. Yet his application for bail has been rejected 22 times. Bail is the right of an accused. The Supreme Court has said so in several judgments. Maybe, the law under which Dr Binayak is detained needs to be amended. He is only an “accused,” not proved guilty. In a climate where even a bail is not granted, desperation is the natural fallout. And what about someone’s right to live? Hindu extremists led by Vishwa Hindu Parishad, a member of the Sangh parivar, have killed scores of Christians and burnt their houses at Khandamal district of Orissa. Even the communist leaders were stopped from visiting the area. A committee of Christian intellectuals which has visited the area has said in its report that the whole thing – killing of people and burning of houses – was pre-planned and executed with the blessings of the administration. My purpose of putting together the different incidents is to point out how the spirit of accommodation, a basic ingredient for democratic culture, is decreasing day by day. There is a lack of engagement in the country. New rules and regulations are made to punish, not to encourage a dialogue. Democracy is nothing but a dialogue. We should never adopt such measures which may kill the basic principles that we want to uphold. The Lt Governor of Delhi nearly did that. This week I would like to deal with two specific queries raised by readers on their rights as users of Automated Teller Machines (ATMs). In the first case, the consumer says that even as he was trying to withdraw Rs 9,000, there was a power breakdown and the ATM did not dispense the currency. However, the transaction slip showed withdrawal of Rs 9,000 from his account. Now the bank is insisting that the money has been collected by the consumer and is unwilling to correct the debit entry in his pass-book. Either due to power failure or severe voltage fluctuations or even due to software or hardware problems, ATMs may not complete the transaction and release the money. Banks are too well aware of this. Banks are also aware that all ATM transactions are recorded in what is called a ‘journal,’ and the hard copies of this are available with bank branches. So, in cases such as this, all that the bank has to do is to cross-check with the journal. If the bank is not doing it, one can only come to the conclusion that the bank is trying to defraud the client. The consumer, therefore, must write a letter to the bank, demanding that he be shown the journal printouts. If the bank fails to do that, he can write to the customer service committee of the bank and also send a copy of the complaint to the Reserve Bank of India. Here the bank is guilty of deficiency and negligence on three counts: First, in failing to maintain the ATM in proper working condition (which includes providing power backup for power failures); second, in issuing an incorrect statement of account; and third, in not correcting the debit entry even after it was pointed out by the customer. So if the bank fails to resolve the issue immediately, the customer has an option to go to the banking Ombudsman or court. The bank should not only return his money along with interest but also pay compensation for the harassment caused to him. 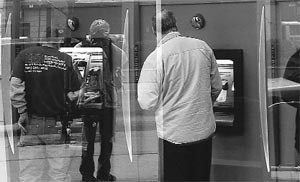 The second case, too, pertains to a faulty ATM, but the nature of the problem is slightly different. During a holiday outside his town, the consumer wanted to withdraw some money. Since he was not sure about the balance in his account, he first obtained a mini statement of account from the ATM, and on the basis of that, withdrew money. Apparently, due to some software problem, the ATM gave an incorrect statement. Unaware of this, the client withdrew much more than the balance in his account. He says he is willing to return the excess amount to the bank, but the bank is insisting that he pay a heavy interest on the amount. I really do not see why the client should be penalised in this case. If the ATM showed a wrong balance in his account, it is obviously the fault of the bank. Why should the customer pay interest on the amount? If the ATM has malfunctioned, the bank should take responsibility for it and not put the blame on the client. The bank is perhaps unaware of the decision of the apex court in the case of Anjana Kundu. In this case a cheque credited by the client was dishonoured, following which the bank apparently sent back the cheque. However, it forgot to reverse the credit entry made earlier in the account. After six years the bank noticed the mistake and blamed the client for not pointing out the mistake, and demanded that she return the amount of Rs 10,000 along with Rs 5,880 as interest. The bank also threatened her with legal action if she failed to do so immediately. Within one week, it even debited Rs 15,880 from her account. The apex court in this case pointed out that the bank had made a mistake in not reversing the credit entry in Kundu’s account, and by saying that she had been informed of the returned cheque, the bank could not put the blame entirely on the customer and not take any responsibility for it. It, therefore, directed the bank to return the interest debited from her account and also pay 5 per cent interest on that amount calculated from the time the amount was debited from her account, till the time of payment. It also awarded Rs 2,500 towards litigation costs. So it’s time banks learnt to take responsibility for their mistakes. There can be no logical explanation for Pakistanis’ obsession with this particular family name, but people in general are not guided by logic. The Pakistan People’s Party of slain leader Benazir Bhutto is bound to be benefited by this factor during the coming elections despite her son and successor Bilawal playing virtually no role in running the party. People seem to have accepted him as a Bhutto though technically he is a Zardari. President Pervez Musharraf has once again exposed his aversion to western-style democracy. He said in Brussels this week that the West is obsessed with democracy which alone, in his opinion, could not help in ensuring stability in Pakistan. The media, as expected, took him to task for his negative remarks on democracy as well as on human rights. “Anyone looking at Pakistan will know that civil society is now willing to risk the accountable ‘disorder’ of democracy rather than live with the insecure ‘order’ of President Musharraf”, the paper added. “The present crisis is taking a heavy toll on the mental health of the people of Pakistan. We know that even during the so-called normal times, the mental of the Pakistanis is severely compromised.” This is what a professor of psychiatry at Karachi’s Agha Khan University, Dr Murad Moosa Khan, says in Dawn (January 23). The situation is unlikely to change in the near future because of the continuing socio-political uncertainty. Pakistan has “one of the highest rates of depression and anxiety (known as common mental disorders or CMDs) in the developing world, with an estimated 34 per cent or 25 million of our adult population being affected”, Dr Khan points out. People’s growing helplessness is mostly a result of what they see on their television screens and read in the newspapers. They are justified when they say that the safety of their lives and property has got no meaning when even the Chief Justice of Pakistan or many top political leaders do not feel secure today.